Oconee County moved one step closer to restricting solicitation on its roadways when the Board of Commissioners tonight gave first reading to an ordinance that would require groups to have a permit and limit the locations of and times for fundraising. Final action is scheduled for the Nov. 3 meeting. No one spoke against the ordinance tonight or or when a preliminary draft of the ordinance was discussed on Sept. 29. 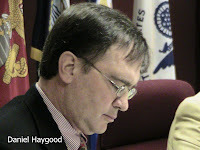 The ordinance drafted and read by County Attorney Daniel Haygood would exempt official county groups such as the fire department from the requirements but would require other organizations to pay a $50 application fee and a $50 permit fee before being allowed to solicit funds on public roads in the county. Only charitable organizations would be eligible for the permits, which would have to be requested at least 15 days prior to the event from the county Code Enforcement director. Each permit would cover not more than two days. Solicitation would be restricted from 9:30 a.m. to 4 p.m. on weekdays, with the period from 11:30 a.m. to 1:30 p.m. excluded. On weekends, solicitation would be restricted from 7 a.m. to 6 p.m., or from sunrise to sunset. Solicitation only would be allowed at signalized intersections designated by the sheriff as appropriate. Solicitors would be required to wear safety vests. At the suggestion of Commissioner Jim Luke, Haygood said he would add a restriction that limited to one the number of permits that an organization could receive in a year. The ordinance only would apply to unincorporated parts of the county, Watkinsville already has an ordinance in place prohibiting such solicitation, according to Mayor Jim Luken. In other action, the board instructed Haygood and county Administrative Officer Alan Theriault to bring back to it proposals for an ethics code that would cover only the commissioners. Earlier discussion had suggested that the code might be more far reaching. Commissioner Chuck Horton and Chairman Melvin Davis said they continued to have reservations about the proposed joint development initiative, while Commissioners John Daniell and Jim Luke supported it. Commissioner Margaret Hale was sick and did not attend the meeting. At the beginning of the meeting, Chairman Davis asked those present to remember Don Norris, 72, a member of the commission for 20 years, who died on Sunday after a battle with cancer.